Move over, Crysis. If you crank all the graphics options up to 11, like we do for these tests, Ghost Recon Wildlands ($50 on Humble) and its AnvilNext 2.0 engine absolutely melts GPUs. 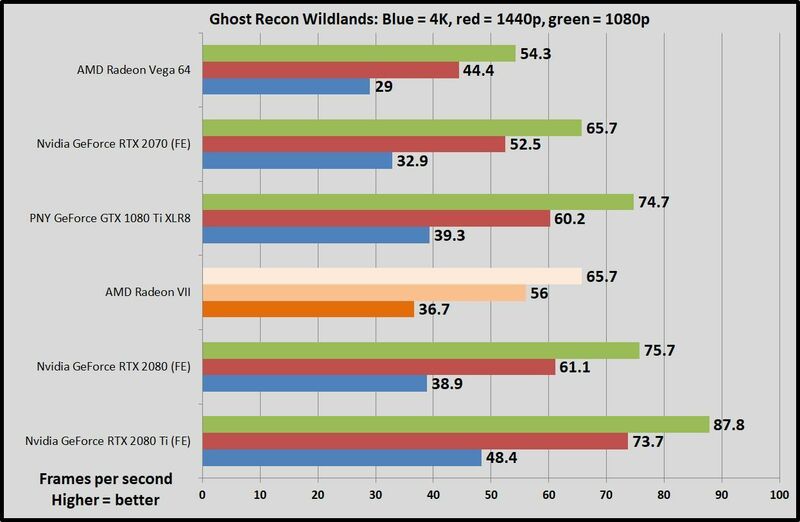 Ghost Recon Wildlands also prefers Nvidia’s GPU architecture in general, putting AMD’s new card very slightly behind the GTX 1080 Ti and RTX 2080 in raw frame rates. In terms of real-world experience it’s effectively a dead heat, though. 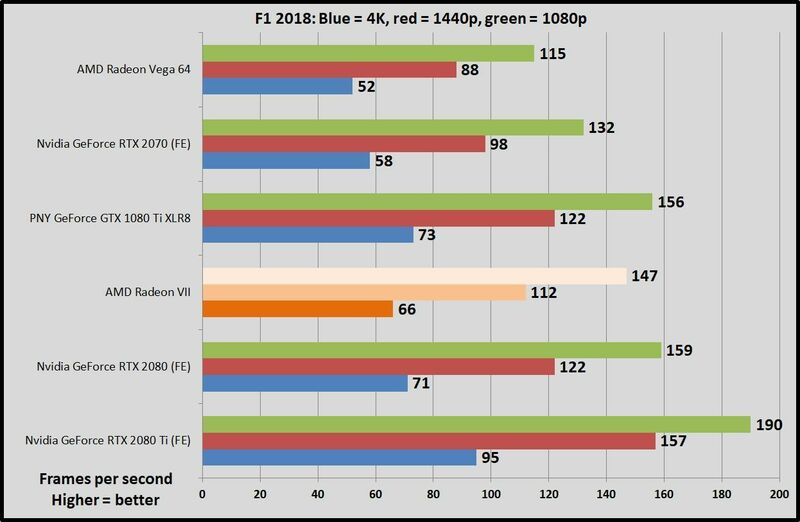 Radeon VII once again claims a roughly 26 percent victory over AMD’s Vega 64. Middle-earth: Shadow of War ($50 on Humble) adds a strategic layer to the series’ sublime core gameplay loop, adapting the Nemesis system to let you create an army of personalized Orc commanders. It plays like a champ on PC, too, thanks to Monolith’s custom LithTech Firebird engine. We use the Ultra graphics preset but drop the Shadow and Texture Quality settings to High to avoid exceeding 8GB of VRAM usage in our testing scenario, because graphics cards that exceed 8GB of capacity are rare indeed. Radeon VII’s 16GB frame buffer would easily let you crank those settings back up if you wanted, though. Once again, while the Radeon VII technically falls behind Nvidia’s similarly priced GPUs by a few frames per second, they offer virtually identical real-world experiences. The latest in a long line of successful games, F1 2018 ($60 on Humble) is a benchmarking gem, supplying a wide array of both graphical and benchmarking options—making it a much more reliable option that the Forza series. It’s built on the fourth version of Codemasters’ buttery-smooth Ego game engine. We test two laps on the Australia course, with clear skies. 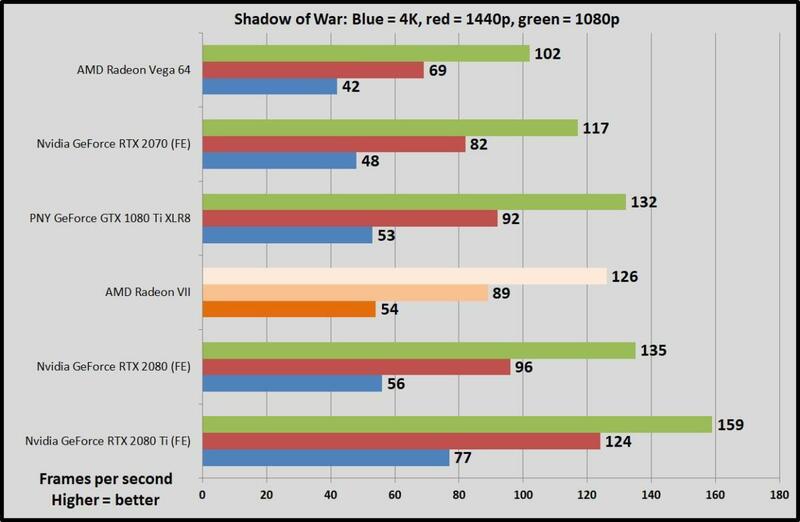 The Radeon VII lags behind the GTX 1080 Ti and RTX 2080 by a more noticeable 7.5 and 10.6 percent, respectively, at 4K resolution. Nevertheless, AMD’s card easily delivers buttery-smooth 4K gaming that surpasses the 60-fps gold standard.